What do you do if you want to change your brother–or sister–into a frog? In this funny and imaginative story by Kevin McNamee, young readers get to take a look at sibling rivalry in a silly way. 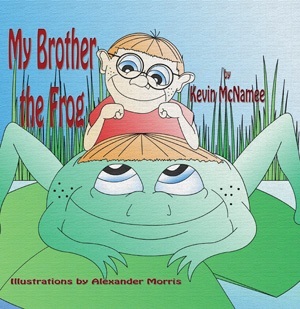 My Brother the Frog is McNamee’s latest release through Guardian Angel Publishing. A young boy decides to change his annoying brother into a frog, which makes everyone mad. When he tries to change him back, he finds it’s not so simple. Suddenly his brother is a very big duckling, then a chicken. They have to make it through many more animal changes before the boy learns something about his brother and about himself too. This is just one zany story. At first I really wasn’t sure where McNamee was going with it. Then as I moved further along and saw how this annoying brother, now in animal form, is helpful to the boy, I realized the subtle message the author relayed with his silly story. Yes, siblings can be pests at times, but they also can do nice things. Alexander Morris provided the artwork for this book. I liked how he managed to capture the brother’s face in each animal once he was changed. I loved the last illustration. I won’t tell you what it is, but it is perfect and made me laugh so hard I thought I would fall out of my chair. I’ve enjoyed every one of McNamee’s books that I’ve read, and My Brother the Frog is no exception. He knows how to reach kids right where they are with fabulous books and unique storylines they’ll enjoy. I can’t wait to see what he comes up with next. I received a copy of this book from the author in exchange for my honest opinions. I received no monetary compensation of any kind to provide my review.